Step 1. Define the problem. Step 2. Formulate the ODE model. Step 3. Solve using patternsearch. Step 4. Avoid calling the expensive subroutine twice. Step 5. Compute in parallel. Step 6. Compare with the genetic algorithm. This example shows how to optimize parameters of an ODE. It also shows how to avoid computing the objective and nonlinear constraint function twice when the ODE solution returns both. The example compares patternsearch and ga in terms of time to run the solver and the quality of the solutions. You need a Parallel Computing Toolbox™ license to use parallel computing. The problem is to change the position and angle of a cannon to fire a projectile as far as possible beyond a wall. The cannon has a muzzle velocity of 300 m/s. The wall is 20 m high. If the cannon is too close to the wall, it has to fire at too steep an angle, and the projectile does not travel far enough. If the cannon is too far from the wall, the projectile does not travel far enough either. The initial position x0 and initial velocity xp0 are 2-D vectors. However, the initial height x0(2) is 0, so the initial position depends only on the scalar x0(1). And the initial velocity xp0 has magnitude 300 (the muzzle velocity), so depends only on the initial angle, a scalar. For an initial angle th, xp0 = 300*(cos(th),sin(th)). Therefore, the optimization problem depends only on two scalars, so it is a 2-D problem. Use the horizontal distance and the angle as the decision variables. Write the differential equation as a function file, and save it on your MATLAB® path. Visualize the solution of the ODE starting 30 m from the wall at an angle of pi/3. 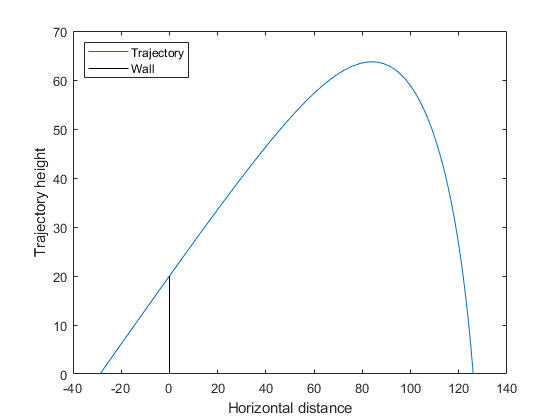 The problem is to find initial position x0(1) and initial angle x0(2) to maximize the distance from the wall the projectile lands. Because this is a maximization problem, minimize the negative of the distance (see Maximizing vs. Minimizing). To use patternsearch to solve this problem, you must provide the objective, constraint, initial guess, and options. These two files are the objective and constraint functions. Copy them to a folder on your MATLAB path. Notice that the objective and constraint functions set their input variable x0 to a 4-D initial point for the ODE solver. The ODE solver does not stop if the projectile hits the wall. Instead, the constraint function simply becomes positive, indicating an infeasible initial value. Set the UseCompletePoll option to true. This gives a higher-quality solution, and enables direct comparison with parallel processing, because computing in parallel requires this setting. Call patternsearch to solve the problem. Elapsed time is 3.174088 seconds. 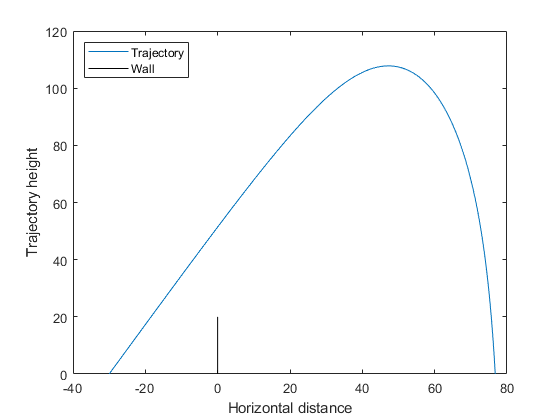 Starting the projectile about 29 m from the wall at an angle 0.6095 radian results in the farthest distance, about 126 m. The reported distance is negative because the objective function is the negative of the distance to the wall. Both the objective and nonlinear constraint function call the ODE solver to calculate their values. Use the technique in Objective and Nonlinear Constraints in the Same Function (Optimization Toolbox) to avoid calling the solver twice. The runcannon file implements this technique. Copy this file to a folder on your MATLAB path. Reinitialize the problem and time the call to runcannon. Elapsed time is 2.610590 seconds. The solver ran faster than before. If you examine the solution, you see that the output is identical. Try to save more time by computing in parallel. Begin by opening a parallel pool of workers. Starting parpool using the 'local' profile ... connected to 4 workers. Set the options to use parallel computing, and rerun the solver. Elapsed time is 3.917971 seconds. In this case, parallel computing was slower. If you examine the solution, you see that the output is identical. You can also try to solve the problem using the genetic algorithm. However, the genetic algorithm is usually slower and less reliable. The runcannonga file calls the genetic algorithm and avoids double evaluation of the ODE solver. It resembles runcannon, but calls ga instead of patternsearch, and also checks whether the trajectory reaches the wall. Copy this file to a folder on your MATLAB path. options.FunctionTolerance and constraint violation is less than options.ConstraintTolerance. Elapsed time is 119.630284 seconds. The ga solution is not as good as the patternsearch solution: 117 m versus 126 m. ga took much more time: about 120 s versus under 5 s.